Memorial benches are a common sight in Britain and the United States. How might the passer-by respond to the inscriptions they bear? Do they view them as an institutionalized graffiti, a witness to the present and the past? As an enticement to pause and ponder? And on what might one ponder? On the motives of the author of the inscription? On the merits of the dedicatee? On the wording itself? Alternatively could they simply be read as a suggestive cue to the view and serve as a discovery guide to the Park? As I was sitting on a memorial bench in New York City’s Central Park on Columbus Day, a chance visual encounter gave me the idea to wander around the park searching out benches bearing interesting or unusual inscriptions. Those benches would then define the location and point of view from which I would take pictures of the park and its visitors. 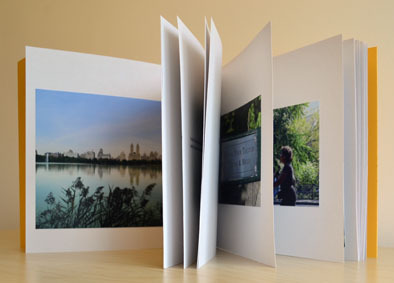 The resulting photobook is a personal exploration of Central Park, mediated by the way in which others have marked out this public space as if it were their own. It is also a discreet portrayal of the park and of its visitors on an iconic day of the year. The original idea was to provide a stylistic sample of private inscriptions in public places, but this was no ordinary place: there were surprises along the way and the growing sense of a specific cultural space and identity. This edition consists of 100 numbered copies. The photographs were printed individually on a Canon PixmaPro-1 inkjet printer using Canon semi-gloss paper 260gsm and Lucia Pigment inks. The text stock is 100% recycled Corona Offset 170gsm and the cover is Context Gold 285gsm, 80% recycled. The Japanese binding was done by Phil Cockburn.